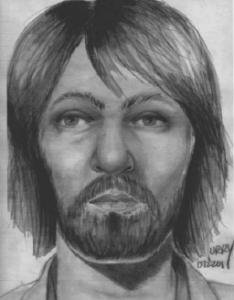 Jefferson County Sheriff’s detectives are still holding out hope that a man found dead in Olympic National Forest in 1975 can be identified. The man, believed to be between 20 and 25 years old, was found in the Cliff Creek area of the Duckabush River basin, west of Brinnon. He was found with a single gunshot wound to the head, and a .22 caliber rifle was nearby. “The arrangement of the weapon supported by a stick and the remote location strongly suggest suicide,” Detective Joe Nole said. 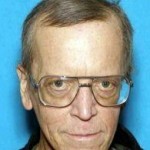 The man’s body was found about six to nine months after he died, in October of that year. 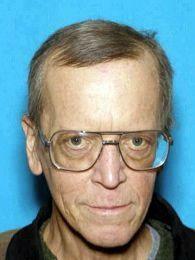 Detectives believe he was wearing new clothes at the time of death, and size 11 1/2 shoes. No identification was found on him. 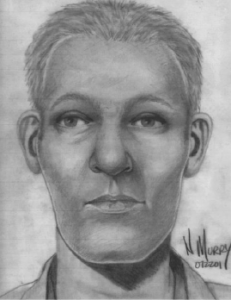 Dental work to try and determine his identity was conducted, but to no avail. But the sheriff’s office recently enlisted the help of the King County Medical Examiner’s Office’s forensic anthropologist — you’ve probably seen her work before in this story about remains found in Port Orchard — and the photos you’re seeing are recreations they made. A DNA profile of the man from a leg bone will be logged into a national database. Anyone who might know who the man is may contact Detective Nole, at 360.385.3831, extension 547, or email him at jnole@co.jefferson.wa.us. Last week, I felt privileged to be able to give our readers a look inside the life of Chris Christensen, a Vietnam Vet who lived in a wooded patch of land just off Highway 3 in Poulsbo. This week, I’d like you to meet three more: Lori, Lisa and Lynn. They are Chris’ sisters, who grew up with their 54-year-old oldest brother in a housing project in Schenectady, N.Y.
Each one sent me notes which will forever go to that little corner of my email inbox that never get deleted. I was taken aback that while dealing with their brother’s death, they wrote to say thanks for telling his story. It is through the miracles of our modern times — the Internet, Google, et al — that our story found its way from that grove of cedars he called home to the corners of the country his sisters call theirs. Chris hadn’t kept touch with his sisters, and they had no idea where he’d ended up. And while we told the final piece of this intriguing man’s life, they wrote me and spoke of all the times that led to it. The four siblings grew up in a troubled home, Lori said. Their parents divorced. Their mother suffered from mental illness. But they always cared for their brother. “Ah, but he was so intelligent and when sober he was so, so funny,” she wrote. He went off to Vietnam in 1972, Lori said. He came back with his addictions, and at some point, got into a bad motorcycle wreck that caused a skull fracture. It was reportedly not properly treated, Lori said. It was then he began the life of a nomad — off everyone’s radar. “He began to wander the country soon after with nothing but a backpack and his thumb,” Lori wrote. He’d come to visit sometimes, Lori said. But his addictions and traumatic life experiences made him difficult to deal with. His independent streak would eventually lead him away. “I can’t explain why Chris was angry with us yet loved us at the same time,” Lori said. They’d heard he lived in Oklahoma, then went to Oregon. He’d hop in with truckers seeking company on long trips. They’d found out his attempts to find religion as a born-again Christian, only to leave the faith because “he’d feel they were trying to control his life,” Lori said. When Chris moved to Washington sometime around a decade ago, Lisa, who’d tried desperately to keep up with him, lost track. Prior to that, when he was in Oregon, she could keep tabs from afar on him, thanks to a woman at a veteran’s affairs office in Oregon. Chris’ mother passed away in 1997. She “suffered daily at the thought of him being out there ‘somewhere,'” Lynn told me. She added that Chris “always had a reason” not to come home. In many ways, Chris’ way of life will always remain a mystery. But I’m thankful we got a snapshot of it. And proud I could tell the piece I knew to the ones who loved him. “I couldn’t have asked for a greater gift than that glimpse you gave us into his world and for the peace we have knowing what the outcome was for my brother,” Lori wrote me. Investigators still haven’t determined the cause of death of two bodies found in Puget Sound Jan. 15. Margarett A. Kirkpatrick, 53, whose body was found in Liberty Bay near her home of Poulsbo, and Shanan Lynn Read, 33, whose body was found between Manchester and Blake Island, were spotted within hours of each other. Read, whose last known contact with anyone hadn’t been since September 2005, has had her death categorized as “suspicious,” by Kitsap County Sheriff’s Detectives. Kirkpatrick’s, too, is still under investigation by Poulsbo Police. However, she had only been missing for two days when she was found. When someone goes missing, the end result, however, isn’t always a death. A recent case in Jefferson County provides an example.